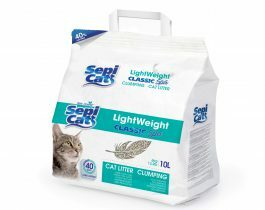 Our amazing LightWeight Extreme clumping litter now available is now available in an unscented variety. Sepicat Lightweight Extreme Original is comprised of 100% natural super absorbent clay micro-granules weighting 40% lighter than the conventional bentonite clumping litters, making for easier handling and use of this product. Minimal consumption: An 8-liter container of Sepicat Lightweight Extreme Original lasts up to 45 days (for a medium-sized cat weighing 5 kg). Natural product: Fragrance and additives free, ideal for sensitive cats. 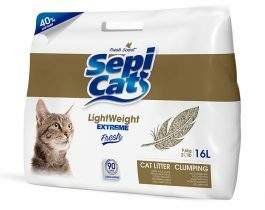 Sepicat Lightweight Extreme Original clumping cat litter is very easy to use: Its special light weight will help you keep your cat’s litter box clean and fresh more conveniently. Pour a 5 cm. layer into the litter box. The cat litter will form compact clumps when your pet uses the bed of litter. Scoop out the clumps and feces. 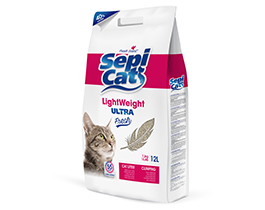 Add more Sepicat Lightweight Extreme Original.